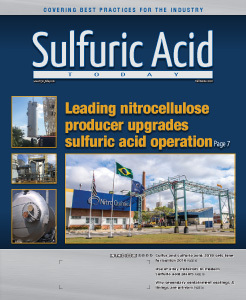 Reviewing the past is useful for planning the future, so for Sulfuric Acid Today’s 25-year anniversary, we wanted to take stock of the major changes in the industry over the last quarter century. We turned to the experts, those with the greatest experience in this business, many over 35 years. We surveyed consultants, product and service suppliers, and acid manufacturers about what they see as the predominant shifts from 25 years ago to today. TO READ THE ABOVE ARTICLES SUBSCRIBE TODAY!